EITNL provides a wide range of Professional Geomatics Services, for both land and marine operations, with a primary focus on Internet-based Geographic Information Systems (GIS) design, implementation and website delivery. In particular, EITNL specializes in developing and delivering custom GIS applications for Municipal Management. Our diverse client base consists of private-sector companies, educational institutions and government departments at the federal, provincial and municipal levels who rely on EITNL to provide proven, appropriate and cost-effective spatial information management solutions. Our GIS is now available for mobile users. 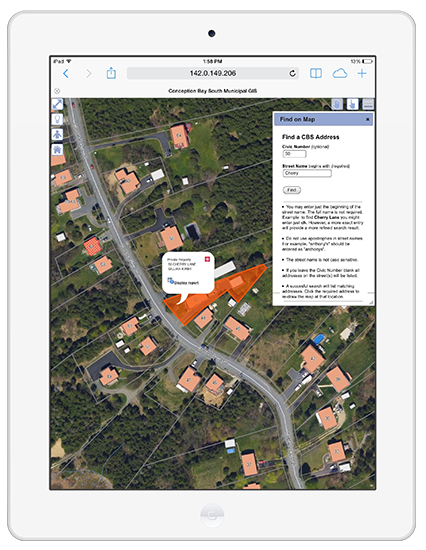 Access your GIS anywhere, anytime from your Smartphone or Tablet. Supporting iOS, Android and Windows devices. Maximize the value of your GIS by adding mobile access.